Teams are let loose in Detling with 300 pounds and a mission: to grab three bargains in an hour to take to auction. Tim Wonnacott takes a trip to Canterbury to discuss the art of Thomas Sidney Cooper. 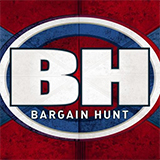 Bargain Hunt was broadcast on Seven at Tuesday 12 February 2019, 23:35.